Adoption of the Employer Pays Principle across all industries is fundamental to combatting exploitation, forced labour, and trafficking of migrant workers in global supply chains and represents an important step in achieving the UN Sustainable Development Goal of decent work for all. Reflecting Principle 1 of the Dhaka Principles for Migration with Dignity, the Employer Pays Principle is a commitment to ensure that no worker should pay for a job. The Principle is increasingly being adopted by companies across a range of industry sectors and locations. 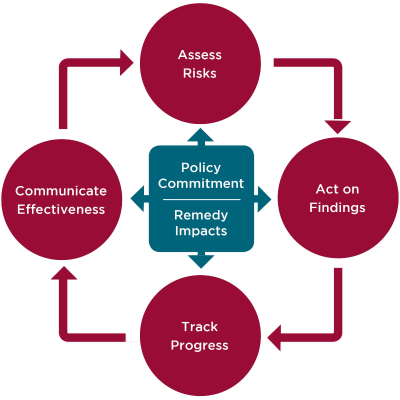 It is endorsed by the Leadership Group for Responsible Recruitment, a collaboration between leading companies and expert organisations driving positive change in the way that migrant workers are recruited. 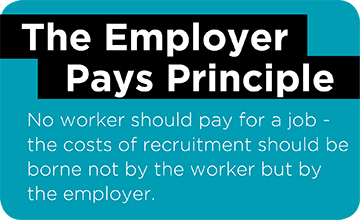 The Employer Pays Principle guides companies committed to responsible recruitment to pay the full costs of recruitment. This short guide breaks down the six steps every company should take to know and show they are meeting the commitment in practice.